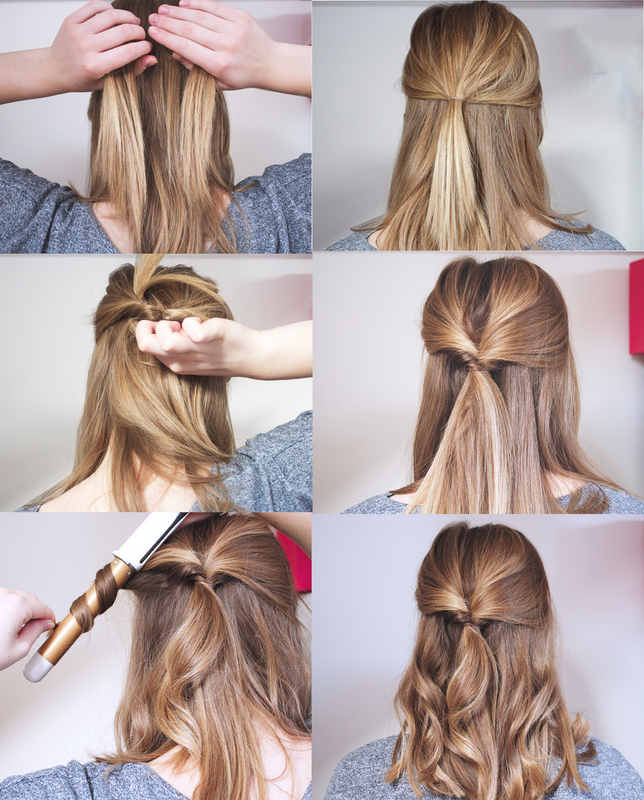 This is one of my most worn hairstyles, because it's super easy and looks very simple and elegant. It can be done with pretty much any length of hair, I did it when my hair was super long and even now when it's shorter. I start by pulling two pieces of hair back and tying with a small clear elastic, it's better to use a substantial amount of hair, just so it stays in place a bit better. You can use whichever type elastic you like but the clear ones work best so that they're completely invisible. I then make a hole with my fingers, just above the clear elastic and tuck the hair through this hole. I then curl my hair using the Nicky Clarke Diamond Shine Pro Salon Styling Wand*, this is so quick and easy to use. There are 5 different heat settings and the top temperature is 210C so you can choose exactly how hot you want the wand, depending on your hair thickness. It is a 25mm barrel so it's perfect to achieve these soft, natural looking curls. The barrel is infused with real diamonds which helps to reduce frizz and make sure your curls are smooth. To achieve the curls I just wrap my hair around the barrel and hold for about five seconds. To get a very natural wave to my hair, I leave a small section at the end of my hair, uncurled. I also make sure to curl the little ponytail, so that it blends in with the rest of my hair. You can buy the Nicky Clark Diamond Shine Styling wand here for only £34.99! Let me know what you think about this hairstyle and whether you would like more of these kinds of posts! Wow your hair looks gorgeous, and that wand is so affordable! Love this hairstyle, it looks gorgeous on you! This is so pretty! I'm definitely gonna give it a go. See also: http://goo.gl/X2prsX for more beauty secrets!